Macedonia became part of Yugoslavia with the European territories of the Ottoman Empire being largely divided between Serbia, Bulgaria, and Greece. 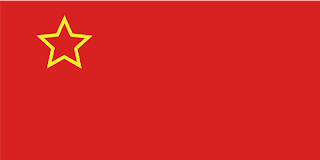 In 1944, the Anti-Fascist Assembly declared the People's Republic of Macedonia within Yugoslavia, and during their first session, created a new flag. 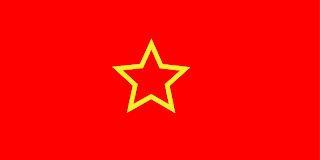 Going back to communism, they adopted a red banner, on which they placed the outline of a gold 5 pointed star in the centre. 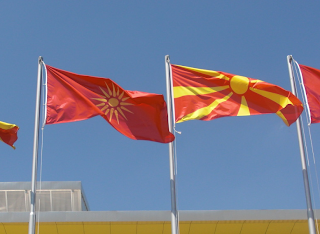 With the ending of the war, Macedonia formally became one of the six republics making up Yugoslavia.Unlike the other states, Macedonia did not adopt the pan Slavic colours of red, white, and blue, but rather just altered the previous flag. Shifting the gold star up to the upper hoist of the flag. With the ending of Yugoslavia, Macedonia carried on using this flag, simply because there was no agreement on what could replace it! In 1992, Macedonia finally adopted a new flag. This being the Vergina flag, using the Vergina sun. This flag was a red banner, with a yellow disc in the centre, surrounded by 16 rays. It was named after the Greek town of Vergina, where it was discovered during an archaeological dig in the ancient Macedonian city of Aigai. 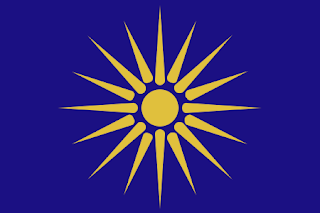 The main problem with this, was that both sides used the symbol as a link with the areas Macedonian past, with the Greek region using the same flag, but with blue, rather than red. 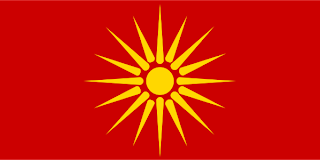 Greece placed Macedonia under an economic blockade in retaliation for Macedonia using symbols Greece believed to be purely Greek. They accused Macedonia of territorial ambitions to try to claim the Macedonian parts of Greece, and attempted to force the nation to change its name. 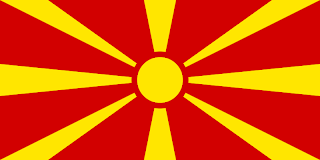 Macedonia is formally, the Republic of Macedonia. However, internationally, to appease Greece, it is known as the Former Yugoslav Republic of Macedonia. 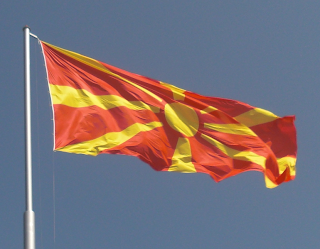 Finally, in 1995, Macedonia brought in a new flag. This time, a yellow disc on a red banner. This time, with 8 yellow rays stretching to the edges of the flag. This represents the sun of Liberty. This banner was not universal, with many wanting to continue with the old flag. It became a common sight to see both banners flown at the same time. However, the new flag finally won the day, being almost unanimously adopted by the government. The colours of red and yellow are seen as the ancient colours of Macedonia, coming from the historical coat of arms of Macedonia.